Apart from relief to families of those killed in natural calamities like floods, cyclones and earthquakes etc, assistance from PMNRF is also given to meet the expenses partially for medical treatment like heart surgeries, kidney transplantation, cancer treatment, etc. Applicants can apply on a fixed application format available at the website and should be addressed to the Prime Minister. First you need a letter from your hospital, in that letter hospital will write patient’s name and cost of treatment. List of hospitals empanelled with the PMNRF is posted separately at the PMNRF website which could be used by the applicant for reference at the time of applying for grant. After receipt of application, disbursements are made at the sole discretion of the Prime Minister, keeping in view availability of funds and prior commitments of the PMNRF. Many states have Chief Minister level similar welfare programmes for medical expenses like heart surgeries, kidney transplantation, cancer treatment etc. जैसे- Government of West Bengal, Bihar, Uttar Pradesh, Gujarat, Maharastra etc. Patient Should be a resident of Concerned state. Annual Income of patient should be below Rs. 1 Lakh. Diseases should be cured in state government hospitals or in Hospitals recognised by CGHS. 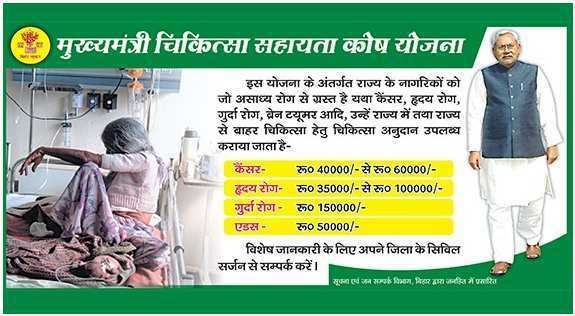 Financial assistance is provided by Department Of Health & Family Welfare under Rashtriya Arogya Nidhi-RAN (राष्ट्रीय स्वास्थ्य निधि) to the patients below poverty line and suffering from major illness (related to heart, liver, kidney and cancer cases) at any listed Government Hospitals or Institutions, to defray a part of the expenditure on hospitalization and treatment. राष्ट्रीय आरोग्य निधिके तहत स्वास्थ्य और परिवार कल्याण विभाग द्वारा गरीबी रेखा से नीचे के रोगियों और प्रमुख बीमारी से पीड़ित (दिल, यकृत, गुर्दे और कैंसर के मामलों से संबंधित) के लिए वित्तीय सहायता प्रदान की जाती है। इसके लिए रोगियों को किसी भी सूचीबद्ध सरकारी अस्पतालों में इलाज करवाना अनिवार्य है. Application form in prescribed proforma duly signed by the treating doctor and countersigned by the Medical Superintendent of the Government hospital or institute. Copy of the income certificate (Monthly) duly certified by the Block/Mandal Development Officer, Tehsildar, S.D.M Administrator and District Officer. Copy of the ration card duly attested by a Gazetted Officer with seal bearing the name and designation of the Officer and Department where working. Revolving Funds have been set up in 12 Central Government Hospitals/Institutes and funds upto Rs. 50 lakhs are placed at their disposal for providing treatment upto Rs. 2 lakh in each case. रोगी एन.जी.ओ और निजी ट्रस्ट से भी फंड का अनुरोध कर सकतें है। कई गैर सरकारी संगठन जरूरतमंद लोगों की सहायता के लिए सक्रिय हैं. Others are Nargis Dutt Memorial Trust, unCancer India, Yuvraj Singh Foundation, The Indian Cancer Society, The Cancer Patient Aid Association, the Cancer Care Trust, Yoddhas and First Hand Foundation are NGOs that help cancer patients. Crowdfunding is a method of raising fund through the collective effort of friends, family, individual investors and other people. It is done by raising money from a large number of people who each contribute a relatively small amount, typically via the Internet. ऐसा ऑनलाइन कसौटीबद्ध अभियान को स्थापित करना, संचालित करना और ट्रैक करना आसान है। अन्य सभी रास्तों के विपरीत, इसमें कोई पात्रता/मानदंड नहीं है, और सिर्फ आपको ये बुनियादी ज्ञान की जरुरत है कि आपकी कहानी को बताने के लिए इंटरनेट का उपयोग कैसे करें ? The government provides railway and air concession to the patients to travel for the purpose of medical checkup/treatment. Travel fare for the patient is free in railways, and the person accompanying the patient has to pay only 25 percent of the actual II class fare. In the case of traveling by air, the patient has to pay 50% of the basic fare of the normal economy class. in the Direction of Swami’s Ideals! Is this organisation mentioned above, help in funding of medical treatment? I dont find such info. in given link. pls don't comment which is not relevant. Thanks for sharing information about heart treatment in India. Ayushman yojna se kya fayda hoga ? Ayushman ya modicare bima scheme hai jo 5 lakh ka health insurance cover deta hai..
Hi bro. I'm Sai ram from andhraprsdesh. I'm Suffering from brain stroke.i want financial help right now. So how can apply to pmrf. and how can I send my application to pm office. But you given address there is no working telephone number of pm office. Send Application via courier or post. Try for above mentioned schemes and crowdfunding also. My daughter have vsd heart disease. She's 1.4yrs old. Doctor have fixed the operation for coming February month.she was underweight now 5kg. Im in poor family. How can I get prime minister relief fund. Pls help me. PM fund is not accessible now a days, Apply for your state CM fund and others options mentioned in this article. Depends on treatment. For kidney transplant upto 2.5 lakh may grant. issuing office of income certificate should be circle or sob divisional? Cm fund nhi Milla .Mai Narayana suprspeciality hospital howrah .ye hospital government ke list me bhi hai. mai ek dailysis patient hu . Apply with supported documents like income certificate, estimated cost and medical certificate etc. to health department of respective state. Available Govt. medical assistance not cover medicine expenses. 2 Photo, Medical certificate, Income certificate and residence proof. Jab apke father hospital me admit ho jaye to medical fund ke liye apply kariye, sabse pahle apne state ke medical assistance fund ke liye application dijiye. How to submit Income certificate if the patient is retired? Father needs a heart transplant. He is retired with no pension. How can we apply for PM scheme? The hospital we are at said they dont do PM scheme. Is this possible? Apply for income certificate with income sources your father have. It may be interest on savings, others income etc. If your hospital is not listed for govt fund, move to other near hospital with all test reports. treatment ke liye hospital me baat kariye aur fund ke liye application de. Apply for each funding options mentioned here. Sir, my daughter is suffering from complete heart block by birth. My daughter is suffering from congenital complete heart block ,pda and whole in the heart,doctors of aiims delhi frist decided to close the pda in the age 5mounth,then operated for whole in the heart . After that they decided to place a single lead pacemaker after that they decided to place double chamber pacemaker,child is carry on her life properly drslatest by told us that pacemaker has to be changed immediately within a time of two or three months.mywhole savings had expended in the above said procedures.now I have money to be expended for the change of pacemaker .Iam in great need of moneyfor above said procedure. I understand your situation..try to raise fund. How much fund can be granted by state for kidney surgery? Depends on states and hospital. For pvt hospital it may 2-3 lac and govt. hospital it may 1-1.5 lac.